Posted in English and tagged English Language Centres on December 6, 2016 by English Language Services. 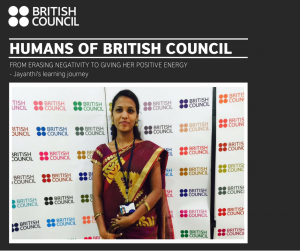 From erasing negativity to giving her positive energy – Jayanthi’s learning journey. Hi, I am Jayanthi and I am 27 years old. My father is a farmer from Thiruvannamalai and I have been working as a staff nurse at a private hospital in Chennai since 7 years. Before I joined the Impact course at the British Council, I was not able to communicate with others in English. I could not express what was in my mind, not even a single sentence. I used to hesitate while speaking to anyone in English. I used to think that grammar is difficult to learn but the way my teacher teaches in class with activities, group discussions, public speaking skills and extempore, it is very easy for me to understand. Nothing feels difficult. After this course I felt very happy and proud of myself. This course is not only for learning language; it also developed my knowledge and erased my negative thoughts. Now I have positive energy to do anything. British Council has taught me a lot and also helped me make new friends from different places. Through my course I got to know that I can learn English by watching English movies, reading books, watching podcasts and the various online learning resources by British Council. I had heard about the British Council one year ago and planned to join a course. I worked hard and waited to join this course. Before I joined the course, the teachers spoke to me and suggested which course will be good for me. I finally joined the Impact pre-intermediate course and now I feel my dream has come true. I wish to continue studying here and improve my language level more and more. I thank British Council for giving me a platform to introduce myself and tell the world who I am.